Please refer to our stock # W-DA3 when inquiring. 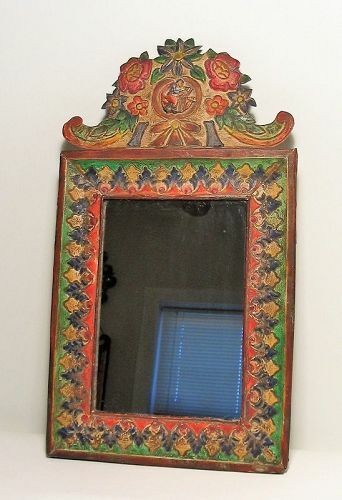 DESCRIPTION: An antique Spanish Colonial style painted sheet metal mirror, 19th to early 20th C., continental Europe. Acanthus leaves decorate the painted border, topped by an elaborate floral crest with center figural medallion. PROVENANCE: From the Collection of Eugene V. and Clare E. Thaw. CONDITION: Good, few minor dents to sheet metal. DIMENSIONS: 19.25" high x 10.75" wide.